I’ve mentioned before that My Little Box is probably my favourite out of the subscription boxes, it’s the only only one which is doing anything mildly different and I love that you get more than just beauty products, plus the illustrations are just beautiful. 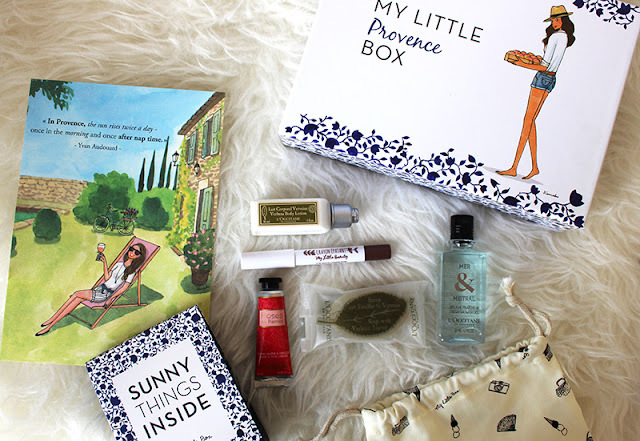 This months box however is even more exciting as they have teamed up with L’occitane to produce My Little Provence Box, merging together the french brands. Inside there is a range of L’Occitane’s best selling products in perfect mini sizes, especially if you are traveling this summer. My favourite is the En Provence Roses et Reines Hand and Nail Cream which is one of my all time favourites, En Provence Mer & Mistral Shower Gel smells amazing and the mini soap and Body Lotion are also perfectly sized. 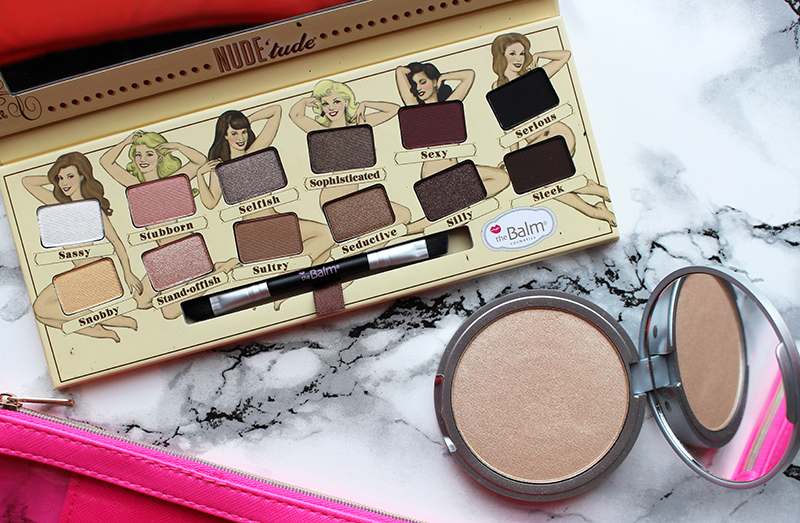 From the My Little Box own brand there is a beautiful metallic bronze eyeshadow crayon which is very creamy and the most perfect colour to reach for if you are on a rush and just need a wash of colour over the lid. The box also comes with a fun magnet sheet which you can play dress up with (sorry forgot to photograph it but it’s super adorable) which is a nice extra touch and also a DIY accessory kit to personalise your own gold cuff bracelet. I attended the launch of the box at the Covent Garden L’Occitane which you must visit if you are ever in central London. I was treated to champagne and a hand massage which was amazing, they initially used a lovely body scrub and finished with their best selling hand cream. I love their hand creams and it’s clear why they are always so popular. 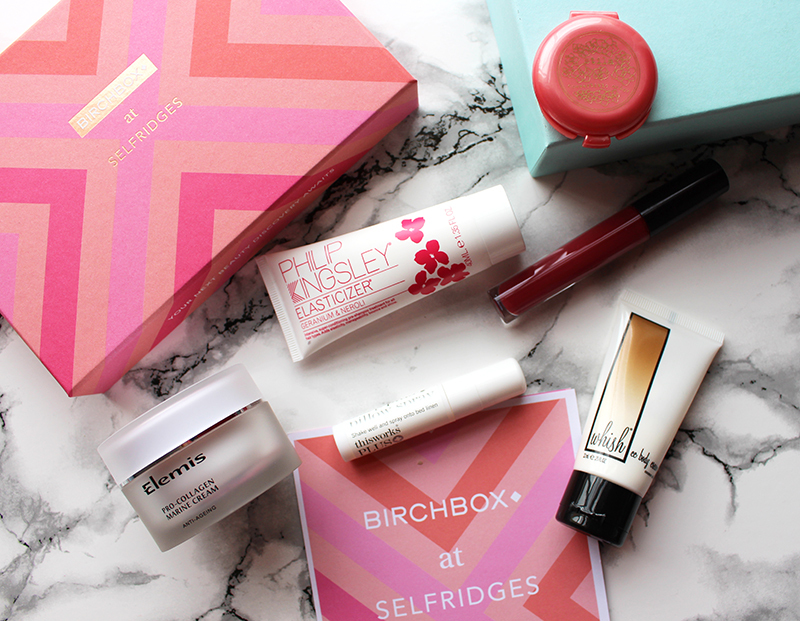 There have actually been some great subscription boxes this month; Birchbox had a limited edition box which you could colour in and the products in GlossyBox were the best I have seen in a long time but this still remains the only one I would personally consider signing up to as I like the mixture of products. A great box to try if you have never tried either My Little Box or L’Occitane, my Little Box’s are £14.95 including P&P and you can order your own here. Since it is International Women’s Day I thought I’d talk about something which I don’t usually cover but affects all women, periods. 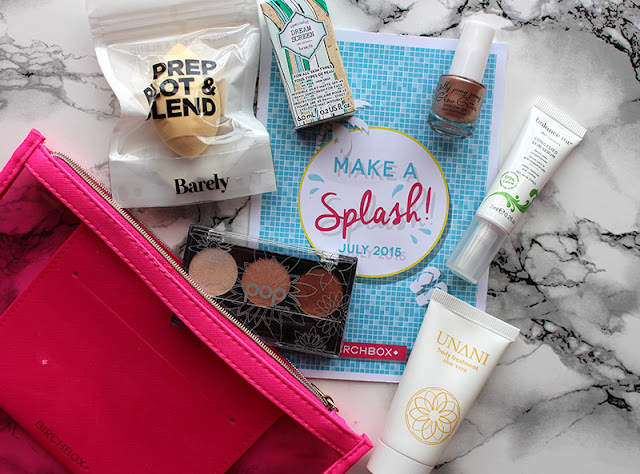 Actually it’s not strictly about periods but instead Pink Parcel a new beauty subscription box that delivers your monthly essentials along with some beauty and lifestyle bits. I haven’t been terribly inspired by subscription boxes recently which is why they haven’t featured much however I thought this quite an interesting one for anyone that always forgets to buy their monthly essentials or simply someone that that would like a few extras along with it. 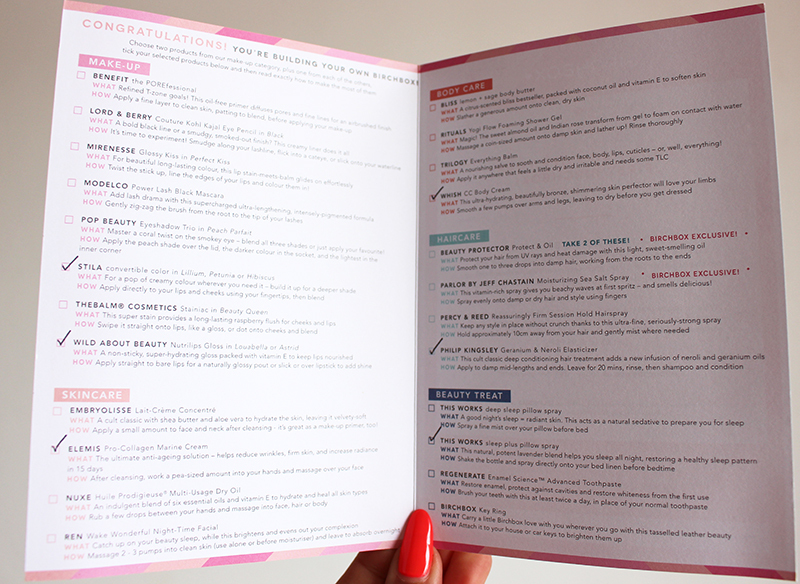 With Pink Parcel you select the tampon or pad you like from leading brands, the date and length of your period and you receive a box with them every month. 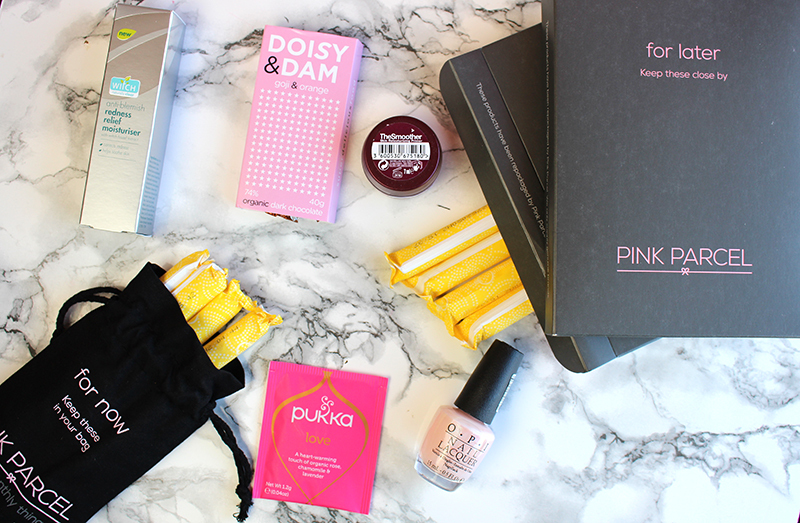 In this months box I was surprised to receive some really great items including a full size OPI polish, a Which Moisturiser, a Pukka Tea sample and Doisy & Dam Chocolate, which is exactly what I want during my time of the month. I also received a lot of tampons, more than I expected and I really don’t think I would need to buy any more for a month. The boxes retail for £9.99 including postage and package, although this is the only box I can really comment on, I do think it’s a great idea, worth the money and really convenient. When I’m on my period I am not always the happiest bunny so I feel like this is quite a nice treat and well thought out in terms of the chocolate and tea bag. 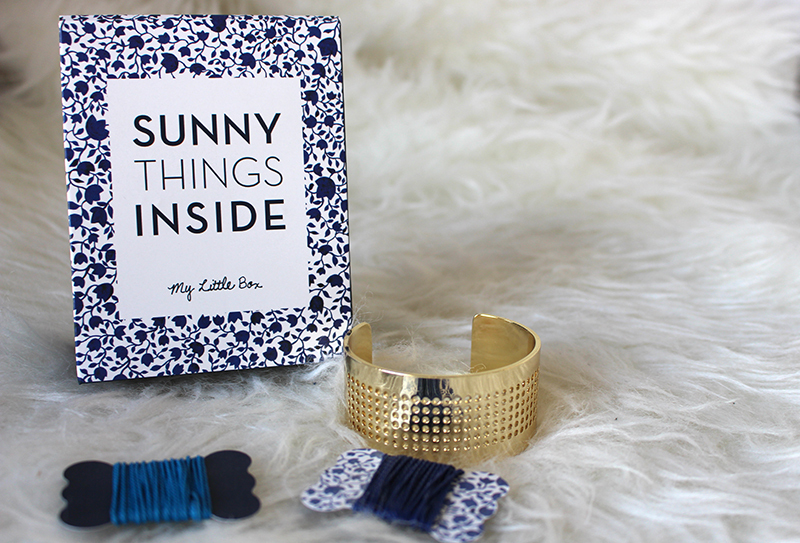 Is this just another subscription box?